Roman Polanski directs Jodie Foster, John C. Reilly, Christoph Waltz and Kate Winslet in this excellent black comedy. Polanski excels at chamber pieces. His debut feature, Knife in the Water (1962) as well as Repulsion (1965), Rosemary’s Baby (1968) and The Tenant (1976) all build their uneasy atmospheres in claustrophobic environments, whether those be a sailing boat or an apartment. With Carnage (2011), Polanski mixes his well-known unrelenting tension with clever dark humour, balancing the two expertly. The dialogue is outstanding. The screenplay, written by Polanski and French playwright Yasmina Reza, is based on her successful play, God of Carnage. Do yourself a favour and see this highly entertaining movie. You can find more information on this French-German-Spanish-Polish production on Wikipedia and IMDb. In India living in a non-metro city, one does not have many opportunities to see recent classics. 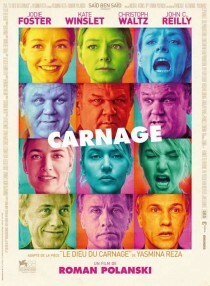 But I was lucky to have seen “Carnage”. Polansky is master of clash of human emotions in a claustrophobic environment. This movie reinforces that observation. Many years ago I ran a film society and showed “Knife in the Water” and has left a lasting impression. I have always thought Polanski has not been able to achieve a higher ground than “Knife in the Water”. I wonder if you would agree. last year I saw Richard Linklater’s ” Before Sunset” and was highly impressed. Is it possible to have a free download of that movie? Can you suggest a safe and legal site for free downloads of old classics as well as new ones? Hi sudhirdalal. I haven’t seen “Knife in the Water” yet, so I can’t comment, but it’s on our to-see list! I agree that “Before Sunset” (2004) is an excellent film! Sorry but I have no download recommendations. Thank you for following, and commenting at my blog! Hei Shimky….thanks for following my blog! Here’s two classic Scottish films to see – “Whiskey Galore” and “Neds”….I would recommend checking them out if you haven’t yet! Many thanks, Stookie, I will! I see that “Neds” is directed by Peter Mullan. Have you seen him in Tyrannosaur? He’s terrific! I watched Carnage today on your recommendation and yes it’s a very entertaining study in human behavior when the onion skins start to be peeled off. Whose Afraid of Virginia Woolf is another and similar movie. recently I watched Richard Linklater’s “Before Sunrise” and the sequel ” Before Sunset”. Both the films rely only on dialogues, no action, no visuals, but tell you, both the films are my favourite. They are like short stories and leave a kind of nostalgic impression. Do see them. I watched Carnage yesterday after reading about it here, Shimky. Interesting. I see comparisons to Virginia Woolf above, but I was reminded of Satre’s play No Exit. It seemed that the four adults were trapped in that room forever. Meanwhile, down in the park, the boys just got on with it. I just watched this a few hours ago. I laughed every step of the way. Hey! Thanks for dropping by KenMaursCorner and leaving comment. It always intrigues me—HOW people stumble intomy blog! Recently I saw the play Gods of Carnage which was true to the play by Yasmin Reza. Was reminded of Roman Polansky’s film. Yes, Polanski’s Carnage is indeed an adaptation of Reza’s play.